If you clamor long enough, and loud enough, we promise we will eventually answer! Three years after our release of the much sought-after original Tepeztate/Sierra Negra ensamble, Aquilino has finally been able to scrounge up enough rare Sierra Negra to craft a second batch of one of his hallmark mezcals. Crafted in the Summer of 2017, this 204-liter batch consists of 23 piñas of wild-harvested Tepeztate weighing 1,118 kg and 7 piñas of wild-harvested Sierra Negra weighing 994 kg. For those of you keeping score at home, that means that each Tepeztate had an average weight of 107 lbs and each Sierra Negra averaged a whopping 300 lbs! All the agave were harvested by hand on 31 July 2017 from the Loma de Cocoshle area near Aquilino’s home of Candelaria Yegolé. They were put into the ground to roast the following day, 1 August and uncovered on 6 August. After roasting for five days, they cooled for two days before being crushed and allowed to ferment dry for one day. 185 liters of fresh river water were then added on 9 August and the must was allowed to ferment for another three days, producing 2,443 liters of tepache. The tepache then underwent first distillation on 12 August and produced 378 liters of ordinario at 29.5% ABV, which was distilled a second time on 13 August, producing 152 liters of still-proof mezcal at 65.5% ABV. This particular batch required 13.89 kg of raw agave per liter of mezcal produced. For proofing, 21 liters of colas at 21.9% ABV were blended with 31 liters of distilled river water, creating a blend of 52 liters at 14.3% ABV which was then allowed to rest for five weeks before being blended with the still-proof mezcal, to create a 204-liter batch of mezcal at 50.60% ABV. This batch of mezcal has a nose of spearmint, grass, white garden flower, and sea air. It sits lightly on the palate, without appearing watered-down, as notes of pine and green apple come into play. The finish transitions to notes of starch and jicama root, with a final return of marine air. This is one of the best spirit pairings for oysters and raw fish we have ever encountered. This batch was so good, Aquilino kept 20 liters for his home stash. Wild Tepeztate growing near Aquilino's ranch. Known variously as du-cual (Zapotec), pitzomel (Nahuatl), de caballo, curandero, becuelo, and others, Agave Tepeztate (a. Marmorata) are some of the most prized agave for producing mezcal. Renowned for their unique appearance and delicate flavors, these agave produce some of the most floral and readily identifiable mezcals. Often growing directly out of rock cliff faces, like Tobalá these agave have a propensity for growing in very difficult and inaccessible locations, making harvesting these unwieldy behemoths notoriously difficult. At the upper end of the spectrum, these agave can weigh around 200 kg, or 450 pounds at the time of harvest! The aromatic high tones to these mezcals can be partially attributed to their lower starch content compared to varieties like Espadín and Coyote. When approaching maturity these agave will often absorb more water than most, further diluting their starch content, reducing the mezcalero's yield and elevating the floral qualities and light finish of these prized mezcals. Despite being seemingly delicate in nature, Tepeztate have some of the most complex, long-lasting finishes in the mezcal world; finishes that continue to evolve over a long period. Aquilino harvesting a wild Tepeztate. While some mezcaleros say that Tepeztate can take up to thirty-five years to mature, the tepeztate of Don Emigdio and Don Aquilino typically take between fifteen and twenty years before they are ready to harvest. However, Aquilino has been able to harvest cultivated Tepeztate in as little as seven to ten years. In 2016 Aquilion planted around 450 Tepeztate plants, with an eye to plant even more in 2017. The distribution of Tepeztate is represented by the green shading in the map below. Agave Sierra Negra is a sub varietal of the Agave Americana family. It takes up to 25 years to mature. Sierra Negra is quite rare. It was widely cultivated many years ago but due to it’s producing very little seed or hijuelos and long times to mature it has been mostly abandoned in favor of Agave Espadín. Agave Tepeztate is part of the Agave Marmorata family and has a very distinct, erratic leaf structure. It produces beautiful quiotes at the end of its life cycle that flower a rich yellow before turning to seed. Tepeztate also takes as many as 25 years to mature. The Sierra Negra was cultivated and the Tepeztate was wild harvested for this batch. According to Howard Scott Gentry, Agave Americana started to appear near what could now be considered the borderlands between the United States and Mexico. They were eventually brought to the central region of Mexico by native peoples that began to cultivate them in the across the Oaxaca valley and into the sierra. 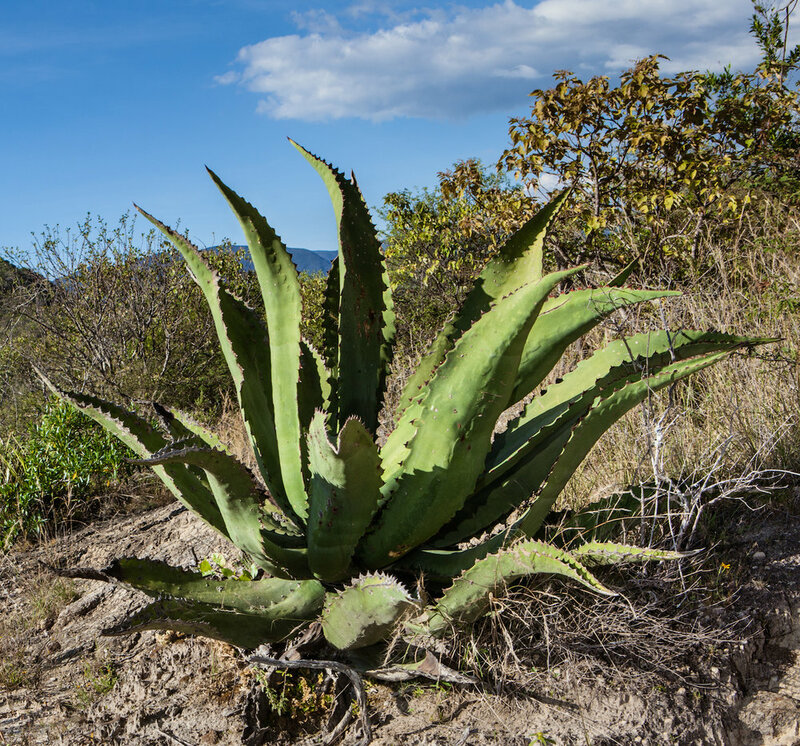 Once very prevalent in mezcal production, they began to be pushed out by Agave Angustifolia as mezcaleros began to realize that Espadín has a higher sugar content and matures faster. The current geographic distribution of A. Americana var. Oaxacensis is represented in the map below by the red coloration. *Image taken from CONABIO website. 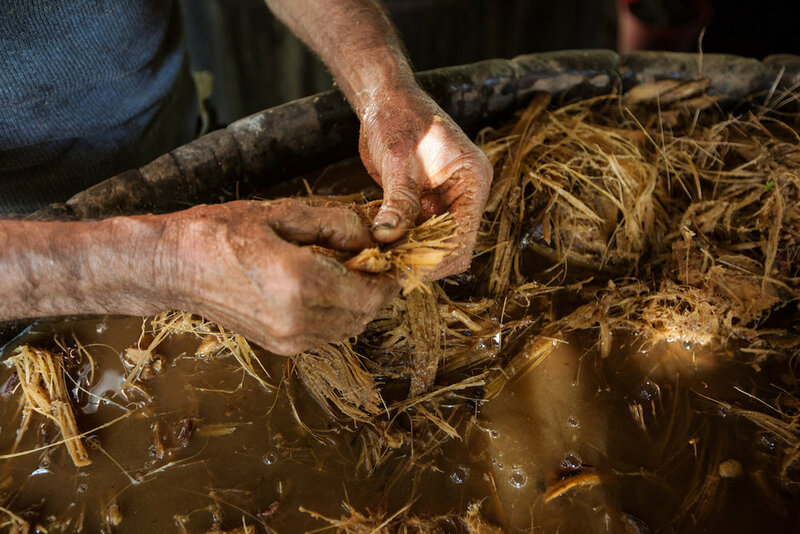 Although Espadin has become the standard for mezcal production, being the source of ~90% of all mezcal on the market, a. Americana continues to be utilized, albeit with less frequency. The species has several sub-varieties with sufficient sugars to ferment and then distill. These sub-varieties include but are not limited to Arroqueño, Blanco, Cenizo, Coyote, de Castilla, Pulquero, and Sierra Negra. Aquilino is the father-in-law of Mezcal Vago’s co-founder, Judah Kuper. This family connection and his exquisite mezcal were the inspiration to form Mezcal Vago. Aquilino had never produced commercially before working with Mezcal Vago and produces exclusively for Mezcal Vago. Aquilino García López, grows Maguey Espadín, and Maguey Mexicano. 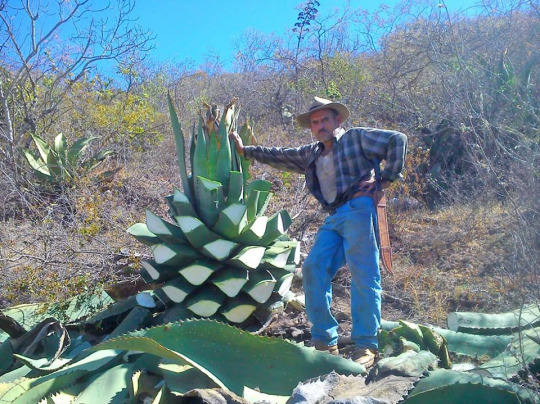 He wild harvests Maguey Cuixe (Tobaziche) and Tepeztate. He has taken over fields from his father and also has family and friends with whom he sources agave. His palenque is in Candelaria Yegolé, Oaxaca (16°29'41.36"N, 96°18'38.69"W) This is a river town in a hot and dry climate at an elevation of around 1100 meters. Two rivers converge in a narrow Valley and it is mountainous on all sides. It is a rugged three-hour drive from Oaxaca city. The palenque is on Aquilino’s ranch where he lives full time. He and his father moved it to its current location 15 years ago. It has moved around from nearby locations over the years. 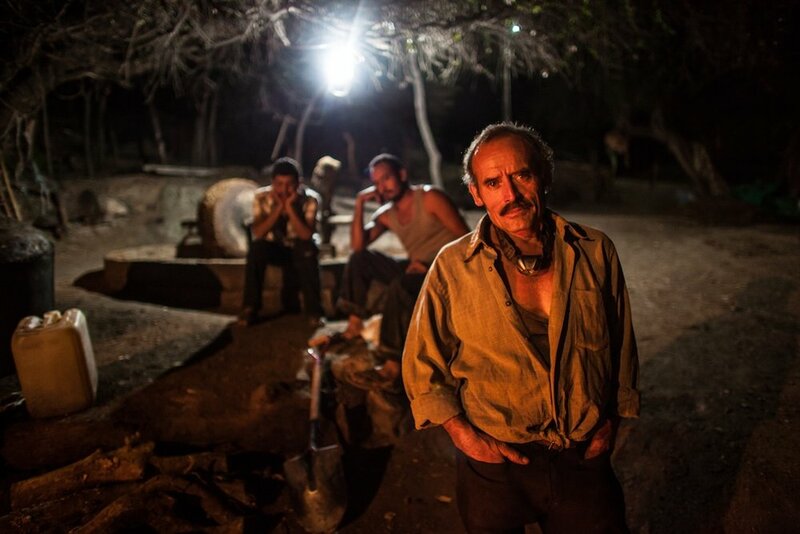 He believes his family has been making Mezcal for at least five generations. Aquilino does nearly all of the work himself. The Agave Espadín and Agave Mexicano both take 7 to 9 years to mature and Aquilino is very careful about only using ripe agave. It takes 1000 kilos to yield around 100 liters of Mezcal. So every 10 kilos will yield a liter. The Espadín we cut ranges from 5 to 100 kilos per agave with an average of around 50 kilos for a well-grown ripe piña (agave heart). Therefore, one ripe Agave Espadín yields around seven 750ml bottles of Mezcal. A bit less but similar for Coyote, Arroqueño and Mexicano. Agave Tobalá and Cuixe yield even less. Batch sizes of Espadín and Elote are around 750 liters. Each batch needs around 7 tons of cleaned and prepared agave piñas. Aquilino limits his batch sizes to one full oven. The Mexicano and the Cuixe are smaller batches due to the availability of the agave. A batch of Mexicano is between 200 and 900 hundred Liters. The Cuixe is between 100 and 300 Liters (he only does around 2 a year.) The Cuixe is very laborious to make. Locating ripe agave growing wild and spread out over a large region surrounding the village takes lots of time and patience. Many of the agave are far from the road and need to be brought down the mountain by burro. The Cuixe is also laborious to clean and prepare and is tough to grind. It is roasted at least a full day longer than Espadín to fully extract the sugars. Aquilino uses a traditional stone tahona to grind the cooked agave. All of the mashed agave and its juices are scooped together into the fermentation vats. A full oven of agave will take a couple of weeks to grind. This helps space out the fermentation process so not everything finishes at the same time. Aquilino’s nine fermentation vats are made of pine and hold up to 1000 liters. The cooked agave and water ferment from the natural airborne yeasts in the air. No additional ingredients are used to make the mezcal other than agave and water. Each batch ferments for around a week. This varies depending on the ambient temperature at the time of fermentation. Aquilino distills his fermented mash before all of the sugar has fermented. This is sooner than other mezcalero’s’ techniques. Aquilino has a copper still that has a 250-liter capacity. He makes all the separations (cuts) by smell and taste. The heads are between 70% and 30% AVB and his tails are between 30% and 15% AVB. Everything else he doesn’t use.